This year’s IBM Think! conference is in iSOA’s backyard and home town of San Francisco. Unfortunately, for the first time in 9 years, I am not presenting with a client, on a panel, or working on a demo. Fortunately, this means that I can be a student and explore all the new technology on the latest from Blockchain to Watson. That’s a lot to learn! With our recent client experiences with API Connect, it will be great to be able to attend classes, and a lab or two, to learn about the latest capabilities of APIC v2018. On that note, we have also updated our case studies page to include our recent client implementation of APIC v2018, which can be viewed here: https://www.isoagroup.com/case-studies/ . As I continue to work with clients on the latest in gateways and API management solutions, I continue to see that API’s are an important next step for many companies looking to streamline their delivery of applications, as well as share key apps and services with external customers and partners. 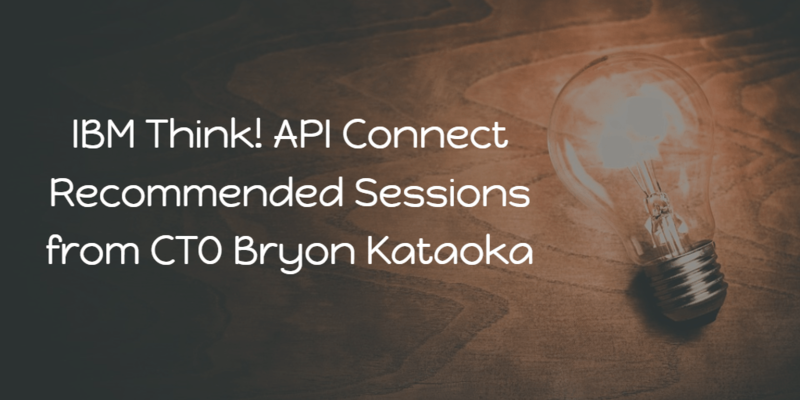 Below are my recommended API Connect classes – and those that I will also be attending. Finally, since I (hopefully!) won’t be holed up in my room working on PowerPoints or practicing a demo, it would be great to meet with anyone wanting to discuss your initiatives and share experiences regarding new strategies and best practices. If you would like to schedule some time to meet, or if you just need restaurant or winery recommendations, please email me at bkataoka@isoagroup.com, or my executive assistant at natalia@isoagroup.com, to schedule some time to talk and “think”. The future of IBM API Connect is in your hands! Have a feature or scenario you need us to support? Attend this session and influence the future of the product. This is an interactive session where we will be prioritizing feature and scenario requests, and addressing questions and other feedback from you! Come and have your say! Today’s patients are more informed and involved in their own health than ever before—contributing to the continuously expanding growth of health data and the expectation to demonstrate value and gain insights from that data. To connect the right data to patients at the right time, IBM Watson Health leveraged real-world data sets to build a cognitive API on FHIR standards, to connect healthcare stakeholders with relevant, personalized, and timely insights. Coupled with predictive analytics, the cognitive API produced risk assessments that can provide patients with knowledge and suggestions aimed at improving their post-procedure recovery based on similar data points. IBM API Connect is an integrated API management offering, with capabilities and tooling for all phases of the API lifecycle. Key steps of the API lifecycle include create, secure, manage, socialize, and analyze. Kubernetes is a portable, extensible open source platform for managing containerized workloads and services, which facilitates both declarative configuration and automation. This session will demonstrate how to setup a 4-node Kubernetes cluster, and deploy an API Connect 2019 cloud. It also offers an end-to-end demo of the product. Virgin Money is modernizing its applications in response to Open Banking, and required support to shift on-premises development to a cloud-native production environment. After a detailed architecture and technology review with IBM and third-party suppliers, Virgin Money choose IBM as a strategic platform and partner moving forward to deliver BackBase into production on IBM Cloud. Virgin Money recognized that IBM Cloud allows them to meet their high availability and disaster recovery objectives while still being cost-efficient and compliant with industry regulations. Virgin Money has been able to save money by utilizing hyper-scalable services on IBM Cloud, and has been able to meet regulatory deadlines, avoiding fines in the process. Join us to learn how clients are disrupting their markets by embarking on a multicloud API journey with a modern container architecture using IBM API Connect and Gateways. No matter where you are within this journey, you are gearing up for scalability, performance, and robust security on the cloud. This will give you an edge to compete and disrupt within your markets. Start on this journey with us and learn from IBM API Connect client experiences and architecture techniques how to create new partnerships and deliver business transformation. Organizations are rapidly undergoing digital transformation, adopting new technologies and APIs to drive innovation and growth. As multiple lines of business adopt APIs and API adoption increases, organizations must drive consistency and governance through all aspects of APIs from development to lifecycle management. APIs are a public persona of an organization and well-defined API governance is of the utmost importance and is the foundation for a successful API strategy. In this session, we will discuss the key ingredients to successfully establishing an API Center of Excellence, and will share best practices for leveraging IBM API Connect in that regard. Security and performance are the two major cornerstones and challenges in any API microservices deployment. But you do not have to sacrifice one for the other. In this session, we will cover the concepts, technology and steps to implement your API solution to get the best security with the highest performance, in order to meet your consumers’ demands.